The Rev. Dr. Luke A. Powery is the Dean of Duke University Chapel and Associate Professor of Homiletics at Duke Divinity School. 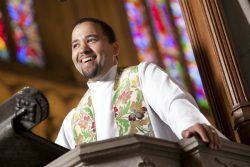 Prior to his appointment at Duke, he served as the Perry and Georgia Engle Assistant Professor of Homiletics at Princeton Theological Seminary. He received his B.A. in music with a concentration in vocal performance from Stanford University, his M.Div. from Princeton Theological Seminary and his Th.D. from Emmanuel College at the University of Toronto. His teaching and research interests are located at the intersection of preaching, worship, pneumatology, and culture, particularly expressions of the African diaspora. He has written two books, titled Spirit Speech: Lament and Celebration in Preaching, and Dem Dry Bones: Preaching, Death, and Hope, co-authored an introductory textbook on preaching, titled Ways of the Word: Learning to Preach for Your Time and Place, and is currently working on two devotional books of meditations on the Spirituals for the liturgical seasons of Advent and Lent.